The California Chamber of Commerce is urging Congress to approve a renegotiated North American Free Trade Agreement (NAFTA) quickly in the face of multiple deadlines for adoption of a modernized and rebalanced pact. U.S. House Speaker Ryan has said Congress must receive the renegotiated NAFTA by May 17 to meet requirements of Trade Promotion Authority guidelines and the U.S. congressional calendar. U.S. Commerce Secretary Wilbur Ross has indicated the NAFTA negotiations must be completed by the end of May to have a 2018 congressional vote, and the July 1 Mexico election date looms. According to U.S. Trade Representative Robert Lighthizer, for many weeks now, the United States, Mexico and Canada have engaged in intensive, continuous discussions to renegotiate NAFTA, building on the seven rounds of rigorous negotiations that have taken place since August 2017. There is a sense of urgency because time is running short to get the NAFTA deal to Congress before the end of the legislative session. The renegotiated NAFTA agreement is operating under Trade Promotion Authority (formerly called fast track trade negotiating authority). This is the process by which Congress gives authority to the President and/or U.S. Trade Representative to enter into trade negotiations in order to lower U.S. export barriers. Once legislation is submitted, under Trade Promotion Authority, both houses of Congress will vote “yes” or “no” on the agreement with no amendments, and do so within 90 session days (not to be confused with a treaty, which is “ratified” by the U.S. Senate). During negotiations, however, there is a process for sufficient consultation with Congress. CalChamber is asking members to contact their representatives in Congress and urge them to vote to support the modernized and rebalanced NAFTA agreements in time for a full vote on Congress this calendar year. 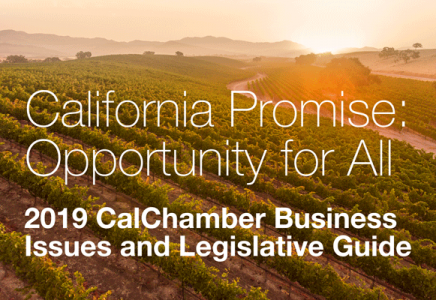 The CalChamber continues to support dispute settlement provisions in the agreement, but does not support the proposed five-year sunset clause, as a forced re-examination of the pact on such a short timeframe causes uncertainty for all parties.